Since Neolithic times the Chinese have believed that Jadeite (hard Jade) and Nephrite (soft Jade) have held mystical powers. The Chinese regard Jade as valuable because of its hardness and durability. They also believe that Jade holds special powers in that it prevents tiredness and, more importantly, slows down the decomposition of the body. A Chinese celadon jade box and cover (FS20/815) that realised £19,000 in a recent Works of Art auction at our salerooms in Exeter. Our major sales all offer online Internet bidding facilities for those who cannot attend our auctions in person. The first pieces of Jade to be carved in early times were ritualistic objects such as knife blades for ji and axe blades. Also included are small decorative objects such as beads, belt hooks, weapons and the six ritual Jades. 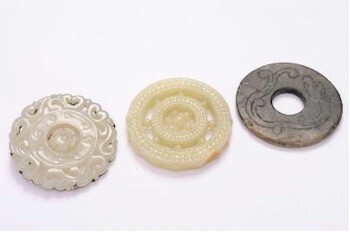 The reason for their use has been lost over time but the six pieces are a Bi (flat disc with a hole in the centre), the Cong, the Huang , the Gui, the Hu and the Zhang. One belief is that they represent Heaven, Earth, North, South, East and West. Three Chinese jade and hardstone pendant discs (FS20/823) fetched £23,000 in a Works of Art auction in October 2013. 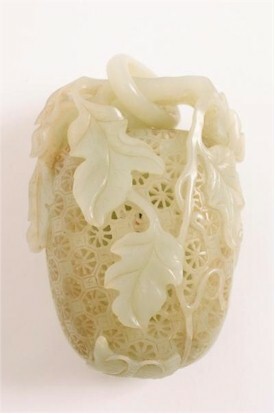 At the Imperial Court, white (Nephrite) Jade was considered the most precious, even more valuable than gold or silver. It was used for brush pots, calligraphy brushes and mouthpieces for opium pipes, again reinforcing the belief that Jade was linked to longevity. The link with Jade and longevity or immortality can be seen in the Jade burial suits used on high ranking personages as well as the placing of a carved Jade tree cricket in the mouth of the dead would also ward off decay. The reasons for the Chinese love of Jade may be blurred in the past but the current market is extremely buoyant. Jade pendants, discs, belt hooks, brush pots have all been offered in our Fine Sales with ever increasing interest from Chinese buyers.